The ultimate protection for instant mobile transactions. On every transaction InstantSAR looks at histories of both the transaction sender and the receiver within preset parameters. "Find the People" versus "Follow the Money"
Over the past 10 years the philosophy behind suspicious financial activity online has been "identify the suspicious user". With so much data (names and addresses) in so many languages producing so many false positives, this has turned into a multi billion dollar problem. 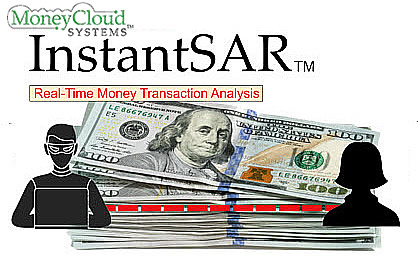 The philosophy behind the InstantSAR System is simply "Follow the Money". What this means is we do not think it is relevant to store and search names and addresses even in the unlikely event that the criminal ones may not be fake. What we have found to be the most effective method is to instantly monitor all transactions as they happen. By tracing histories of both sender and receiver accounts via thresholds and time periods, reportable suspicious activity is easily identified. Due to the speed of execution, this system is transparent to the user. Currently estimates show over 400 Billion electonic monetary transactions per year and network penetration is a major threat.